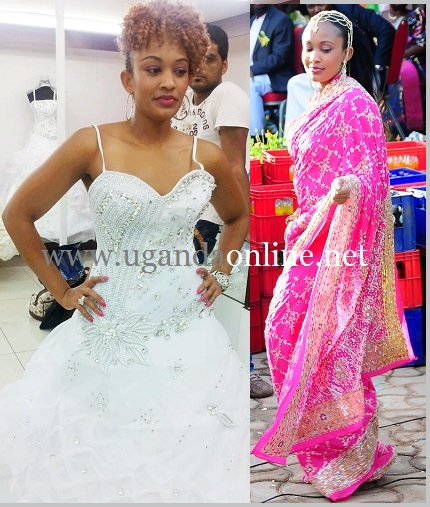 South African based socialite Zari Hassan has been trying out her wedding gown and practising how to walk with it ahead of her day that is yet to be announced. Insider sources say, it should be before X-mas this year though Zari is still tight lipped. With her controversial love life, It was unfair for her to start off the cat-walk rehearsals before setting the record straight on whether it was Ivan or the basket ball player, Issac Lugudde. This forced her to tweet what she is terming as an official statement on the Ivan-Isaac saga that has left many confused. "Am not getting married neither I'm I dating Lugudde! My apologies to all parties involved! My kids and work r my priorities." This statement could not go unchallenged as far as the basket baller is concerned but Zari swiftly defended herself. "We did date a while but as of now I'm setting the record straight", Zari replied to one concerned follower on twitter. Isaac Lugudde was quick at thanking Zari for having cleared the space but his next line left a lot to be desired. "No need for apologies, PLZ just don't mention my name in ur tweets! Damnnnnn. It's funny how people get used and played in the name of "attention" but it is what it is! Life goes on! lol"
Recently, Isaac got The Boss Lady tattoo on his ribs, still has a wide collection of steamy pics with Zari but all this is fast turning into memories. The former exes, Zari and Ivan are now busy promoting and supporting each other on their forthcoming events. Zari is behind the Zari All White Party to be held at Guvnor on the 27.Dec.2012 and three days later, it will be the first ever boat cruise by Ivan Semwanga that will take off at Gaba with tycoons paying 1m, Ordinary for men 100,000 and free for the hot bikini babes.